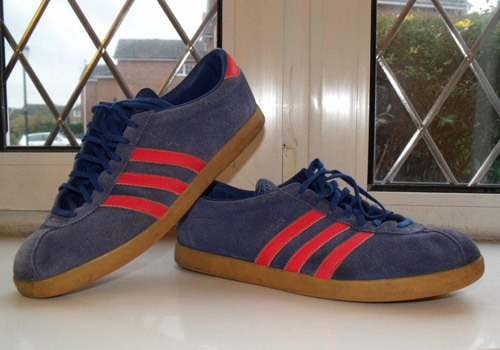 What’s better than a nostalgic, time-worn pair of vintage adidas? 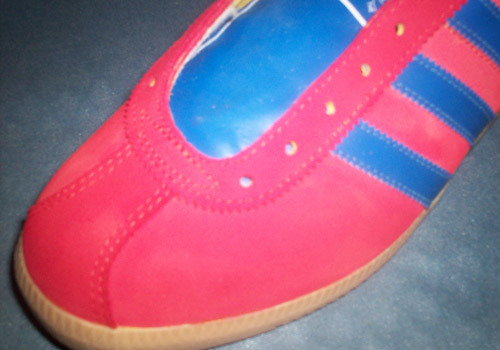 A shining, brightly colored, restored pair of vintage adidas! Every vintage trainer collector’s dream is to have that box-fresh pair of old school kicks and now it’s possible thanks to rare folks out there like John Schofield, who have found reliable ways to not only re-color and refurbish old trainers, but to entirely restyle them for a new look on an old silhouette. This Spring eatmoreshoes managed to pluck some quality time with the growing trainer restoration, re-dyeing, and customization artist from Great Britain. If you don’t know John Schofield already, then lace yourself up in some worn-down “Made in France’s” and follow along for a ride through what he does best. To start, can you tell us a bit about yourself? My name is John Schofield, I’m from Southampton originally but been living in Harrogate for the last 20 years. I’m a family man with grown up children and I’m a joiner / carpenter by trade. How’d you first get into trainers? 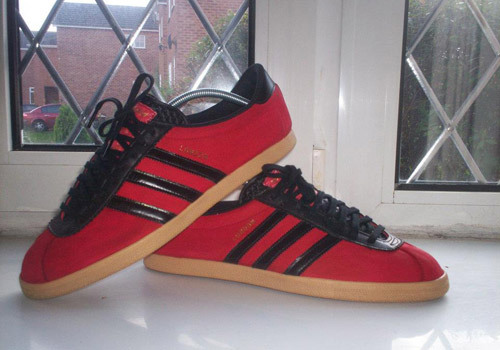 I got into trainers like most lads, an extension of the “casual scene” I just found myself putting more time and passion into collecting the three stripes than anything else. My real love lies in the vintage side of collecting although there have been a few re-issues recently that have joined my collection, Baltic Cups and Tobacco to name a couple. What lead you to trainer restoration and customization? 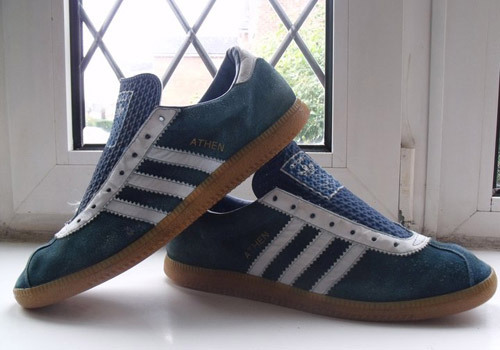 Collecting vintage adidas really. I’d find them up for sale in good condition but they were faded or generally tired looking. 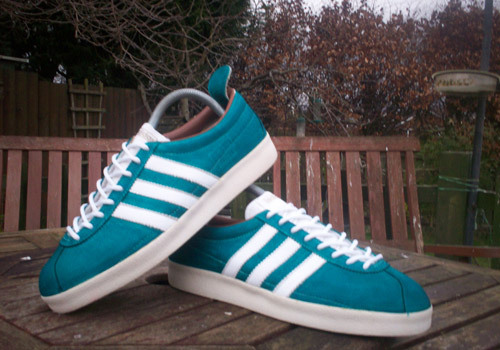 I’d heard of one or two others who’d actually re-dyed trainers with varying success so I thought I’d have a go myself, got a bottle of blue angelus suede dye and took the plunge on a tired looking pair of Bern, and the results were outstanding! 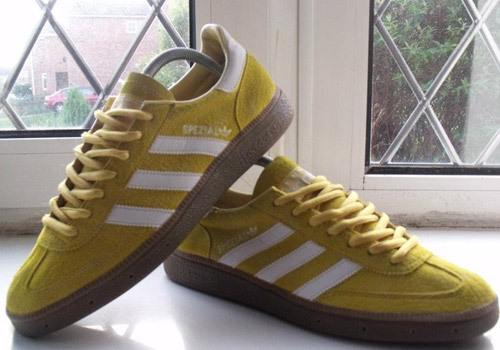 I found it very easy to do and I ended up with a pair of 30 year old trainers that looked liked they’d been pulled out of the box for the first time! Yes, I just bought more colours of dye and starting practicing on my own collection and posting the results on a forum, then I started getting enquiries from other people asking if I’d be prepared to dye trainers for them. I realized there might actually be a market for this kind of service and so I set myself up with all the materials needed (dyes and brushes) and offered my services, first on a couple of clothing and trainer forums, and then on facebook. The rest is history! Can you tell us any horror stories along the road to becoming a professional? Fortunately (touch wood) I haven’t had any disasters! 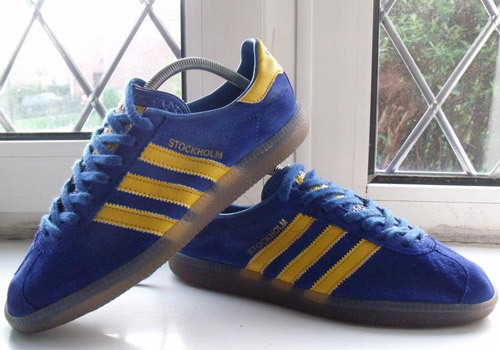 I’ve had a few pairs that were beyond restoration in my opinion but I still worked on them and although they became a bit of a nightmare the end results were acceptable given the circumstances. We all know the saying “you can’t make a silk purse from a sow’s ear!” well it’s completely true! 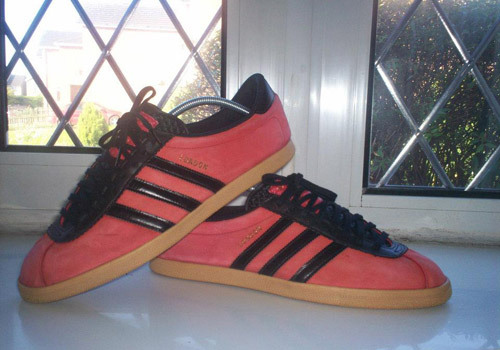 I did recently have a pair of Spezials that I was supposed to dye orange, and I was recommended to use angelus “rust” on them but they actually came out a colour more resembling pink than orange! Then I had an uphill battle mixing colours together trying to get them a respectable hue, even using red on them. In the end I did get them close, though I was very disappointed with the outcome. Thankfully the chap who they belonged to was actually pleased with the results so that was a relief! I spent weeks on them and they must have ended up with at least six coats of dye so I lost quite a bit of money trying to get those right for him! That sounds nerve-wracking John! Could you break it down for us, step by step, what’s the process behind your work? The process depends on the condition of the trainers when I get them. If they’re dirty then they need cleaning first. 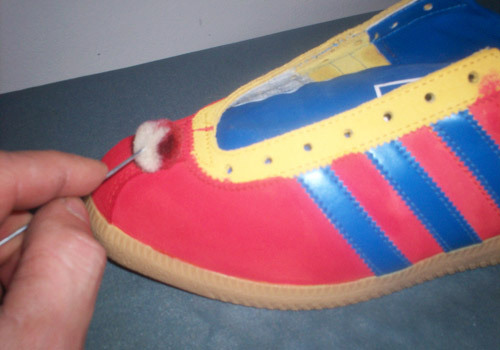 I go over the whole of both shoes with a foam suede cleaner even if both don’t need doing, reason being if the cleaning alters the suede in any way the alteration is even on both shoes. 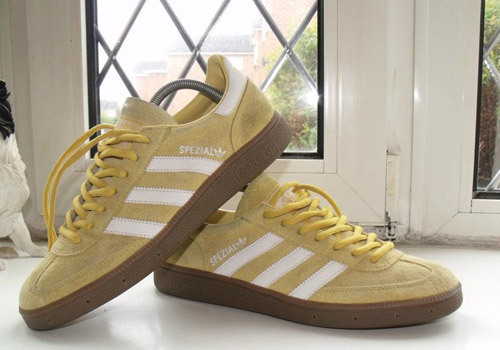 Then they go through a short cycle in the washing machine to remove any suede cleaner. 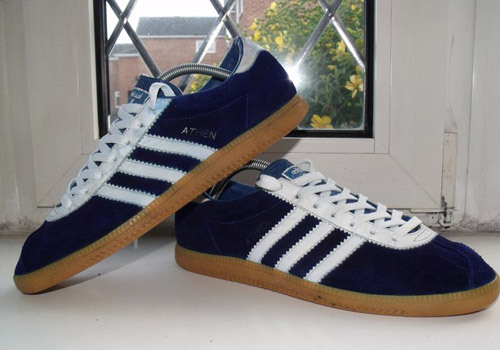 Afterwards I gently bring the suede back up with a toothbrush then they’re stuffed with paper or put in shoe trees to restore and keep a good shape while drying naturally for a couple of days. Wait, what? You actually put your shoes (and others’ shoes) in the washing machine? Is this safe? Yes! It’s perfectly safe! 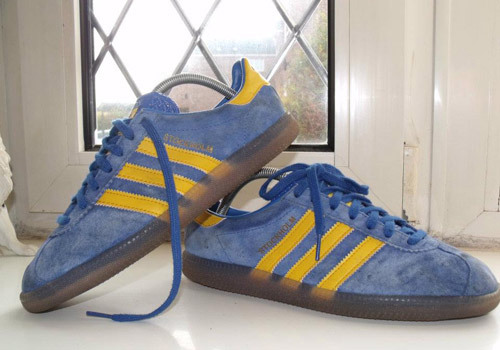 Although I wouldn’t recommend it for general cleaning of suede trainers as it does have a tendency to fade them. Obviously as I wash them for the purpose of re-dyeing the fading isn’t really an issue, and if anything it even helps the re-dyeing process as it’ll fix a better colour. 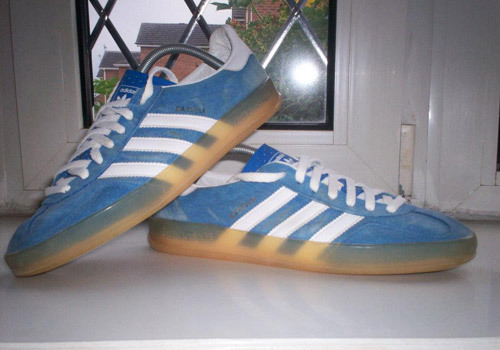 I just use a normal wash tablet and if they’re really bad I’ve even added a few caps of bleach to the mix, none of which has ever damaged the trainers in any way, although the Mrs. has given me a few disapproving looks when the machine is clunking away full of trainers! Fair enough John, so go on… what’s next? 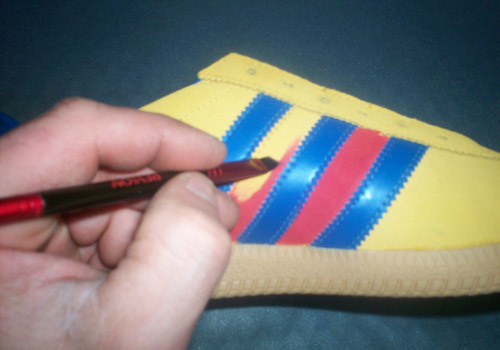 When they’re dry I go over the trainers again, gently with a suede brush to bring the nap back up, then apply the first coat of dye. 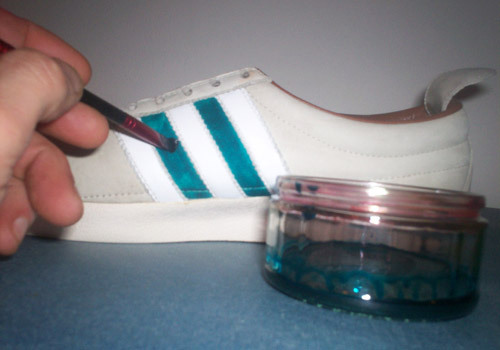 I use a small brush for the detail work – between the stripes and next to the sole – and the dabber that’s supplied with the dye for the larger areas. You have to work in “areas” to avoid the dye drying and ending up with any overlap, and making sure you get the dye under the edge of the stripes can be tricky! I let them dry, usually a day, buff ‘em up, and apply another coat. Sometimes only two coats will suffice but others have taken three or even four coats to get the colour consistent and showing a nice depth. What sort of tools and materials do you use for your restoration? Tool wise, I’ve a selection of fine brushes. I actually use the same brushes women use for applying makeup! Revlon is my favourite make! They’re not cheap but they’ve a nice edge and hold together well when applying the dye. I also use various containers and tubs for mixing dyes as I find it easier to work out of a tub rather than the bottle because you can just dip the tip of the brush in it instead of the whole brush! I’ve also got different types of suede brushes and toothbrushes, and a tube of shoe glue for any loose edges on the sole, although I try not to get involved in sole transplants as I’ve enough on with just the dyeing side of things! What’s the most far you’ve ever gone with a restoration / customization job, such as cutting fabric or restitching? I’ve been pretty unadventurous with regards to trying other things. I know a lad who is painting stripes and all but as I’ve already said I’d just find I’d be taking on too much if I started doing this as well. That said I would if the customer was prepared to pay for the materials involved as I don’t keep them myself; the range of leather paints is huge so I don’t want to shell out on stocking these then find I was rarely using them. That makes sense. Can you give us an idea of your customer base? Customer base? I’d say it was mainly lads. As a personal collector, what’s your collection like? Have any favs? My own collection is relatively small, probably around 30 pairs but mainly vintage. Quality not quantity I say! My favourites? That’s a hard one! Jap Athens, Bern, or French Tobacco. 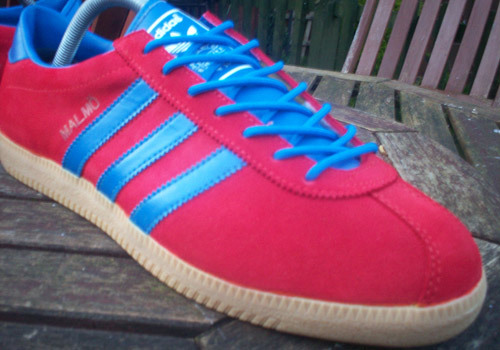 If I was lucky enough to own a pair of T-Master then it would be them! One day though, one day! Have you ever considered designing shoes? 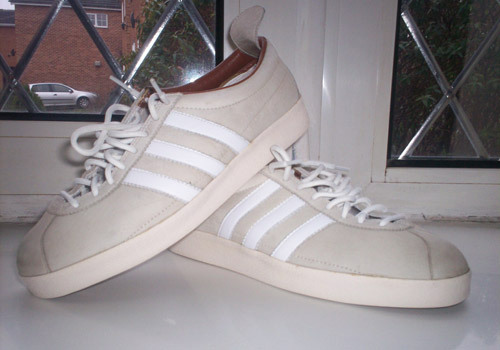 I’ve recently bought a couple of pairs of the white suede Tobacco that I’m going to hopefully create two unique colourways on so I suppose you could classify that as designing shoes in a way. 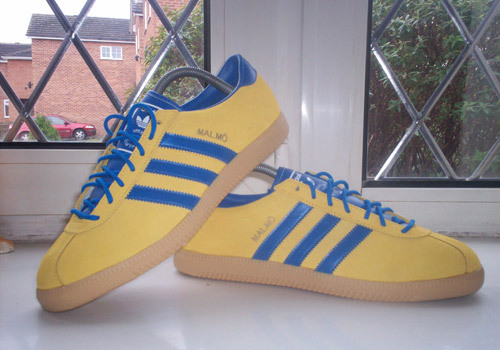 Then there’s the Malmö that I recently did for someone in the rouge colourway. They’re outstanding and have caused a bit of excitment to the point that Size? themselves were keen to see the results, still waiting to hear what the outcome of that is but the talk is they want me to create a pair for them to put on display in their Manchester shop. We shall see though. Wow, big moves John! So, what’s next for you? Just more of the same I think, although I can see myself doing more of the complete colour changes, customizing rather than just straight re-dyes. Lastly, but most importantly: how can people get ahold of you for your services? People can contact me by email at northyorksaint@hotmail.com or they can search on facebook for my page. 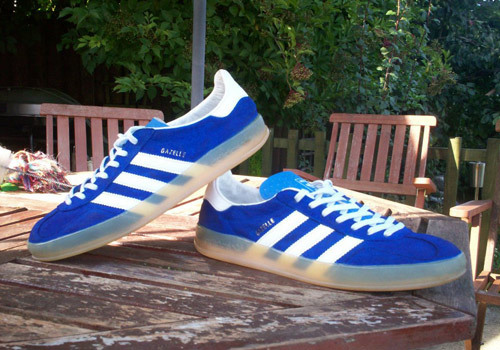 There they can see quite a big back catalog of my results as well as my own collection of adidas. Cheers John. Big thanks for giving up some drying time to talk with us and paint a background picture to a finished product you can be surely be proud of! Some real nice restorations there. Do you have any problems with the dye running or soaking through to your socks if the shoes get wet at all, or does the dye pretty much set into the fabric? Wanted to try suede customs in the past but been a bit hesitant to start messing around with dyes. hello Deamo, first thanks for the compliment, its appreciated. 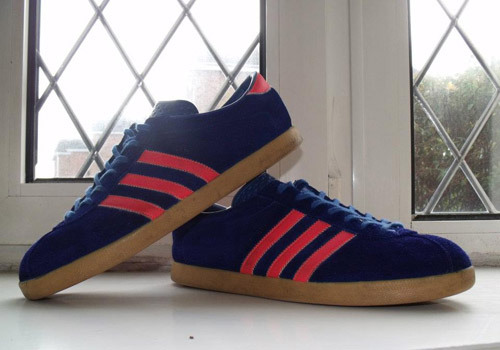 in answer to your question, once the dye is dry its fixed, it doesnt run at all and you treat them the same as you would any other suede trainer. Give it a go mate, you might find its not as hard as you think (but then again it might!!) you wont know though unless you try, just pull out a pair your not likely to wear again and have a go! One other question John, how do you refresh the city stamp? Impression stamp with gold paint? I wouldn’t even be able to think how you’d do it John? How do you do this? Would love my Londons (bern colourway) re-dying and touching up! Would you consider doing this or? Do you still take orders pal?